Wow, I can't tell you how hard it is to believe that I've reached the one year mark with this little blog. Last fall, after having read other blogs for years, I finally decided to jump in head first and join the blogging community. I haven't looked back once. 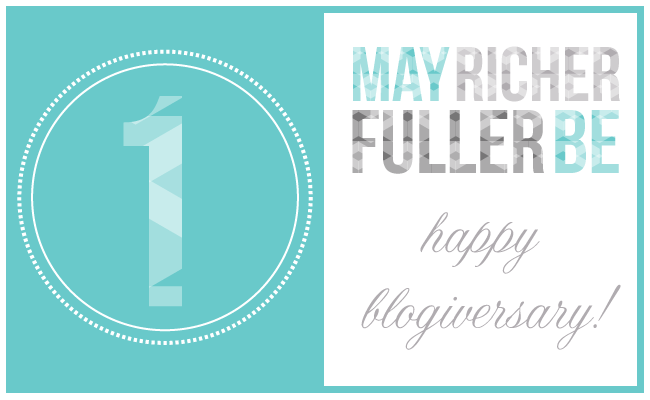 May Richer Fuller Be, or MRFB as I like to call it, has certainly grown and changed a TON in the past 12 months, and I think it's only fitting that my "blogiversary" falls during my 31 Days series on using and loving what I have. I am so thankful to have this space to ramble about DIY projects, organizing endeavors, graphic and interior design, and life. My husband is grateful too - he doesn't have to hear me brainstorm and talk about every last creative idea I have! ...and has evolved over time into what you see today. I think the change and evolution in my blog reflects how much I've grown as a blogger. I've learned so, so much, and it's been quite a journey to get where I am today. Then there's my favorite aspect of all of this blogging stuff - the COMMUNITY. No one is more surprised than me that people seem to like what I'm doing and want to follow along. (Seriously, it's still shocking to me sometimes.) I've received amazingly kind, humbling feedback from y'all, and am so grateful for each comment you leave, email I receive, photo you pin, and even the likes I get on Facebook. These things don't go unnoticed. So thank you. Y'all really are the best. I wish we could be real-life, in-person friends. If you're ever nearby and want to grab a cup of coffee (or heck, how 'bout a glass of wine? ), I'm game. Continue to connect with YOU and other bloggers! MRFB has come a long way in a year! I can't wait to see what the next twelve months have in store. P.S. Thanks to those who've filled out my reader survey. I'm grateful for your feedback and can't wait to act on some of the ideas y'all had - some of which are in that list above! Congrats. Keep up the good work! Congrats, Chaney! You have more than a knack for this stuff and your passion comes through your projects and your writing. To another great year!